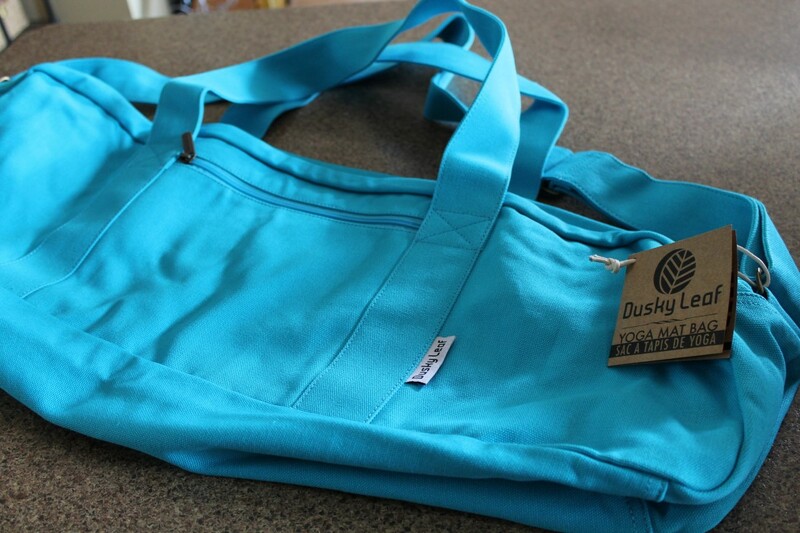 As a modern day yogi and woman always on the go, it’s as if Dusky Leaf’s – cerulean blue B.I.G Yoga Bag was created specifically for me, not only for it’s fabulous turquoise colour, but also because of its massive size and features. From the minute I received my big yoga bag, I fell in love with it. Its easy adjustable shoulder straps, wide carrying handles, heavy duty zipper, inside and outside pockets, and its rugged cotton canvas exterior (among other things) make my life easier, especially when living out of my yoga bag. 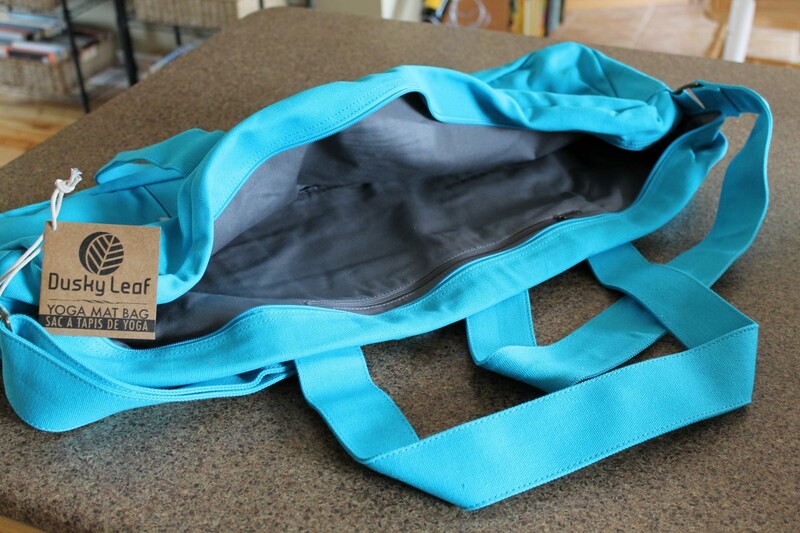 This particular yoga bag is designed for anyone who seems to constantly be on the go (or a busy-bee traveler like me). No need to run back and forth between home and the gym/yoga studio; you can take everything you need for the day (or weekend) in the one bag. From a heavy duty extra long natural rubber yoga mat (as shown in the image below) to a change of clothes, this yoga bag has room for it all. The B.I.G Yoga Bag showed up in my life at exactly the right time. I’ve been able to use the big yoga bag for the last few weeks of Yoga Teacher Training. It’s made transporting my equipment easier, not to mention I’ve become easier to spot with my bright blue bag. It’s no wonder that this turquoise lover ended up with yet again another turquoise yoga accessory. I love it. I wonder how many I can collect. The bag’s breathable material makes carrying the bag in the summer easy, as other synthetic yoga bags I’ve tried can cause me to get overheated or to sweat while carrying the bag for long distances. It truly is the perfect yoga carrying bag, especially for yoga teachers or yoga teachers in training who have a few extra items in tow. It’s B.I.G- The sheer size (28″ L x 9″ H x 6.5″ W) of Dusky Leaf’s B.I.G Yoga Bag makes it the perfect yoga bag because it has room enough to carry a yoga mat of any size, yoga towel, yoga strap, water bottle, change of clothing, full-sized yoga block, and MORE. Why leave the yoga socks, leg warmers, sweater, and other yoga accessories behind when they fit perfectly inside the gigantic big bag. The B.I.G Yoga Bag is also the perfect yoga bag for the person, like me, who is always on the go. Although the yoga bag is bigger than the average yoga bag, it’s not so large that you feel like you’re carrying around a duffle bag. I think it’s the perfect size; its inside and outside pockets allow the bag to maximize its space. Its wide handles and adjustable shoulder strap make the bag easy to transport all the necessary yoga gear around, especially for yoga teachers who carry more than the typical yogi. Durable & Breathable- The big yoga bag is made from a rugged cotton canvas, which is considered an extremely strong and breathable material. The bag comes with strong buckles and a mega heavy duty, full-length zipper designed for heavy loads and quick access. Unlike most synthetic thin-fabric yoga bags, the big bag is made for active individuals who have a busy lifestyle and need everything to be located in one place. I’ve not seen any yoga bag like this! I’m loving how I can leave the house in the morning with everything I need for my day of fitness fun at the gym and yoga studio. Natural Materials- Dusky Leaf’s B.I.G Bag is all natural–from the outer canvas to the inner trim it’s all eco-friendly. Instead of using a synthetic material, the bag is designed with a versatile material called cotton canvas. Yes, it’s the same kind of canvas that has been used for thousands of years as sailcloth to propel big boats. The durable canvas is exactly the material needed for the big bag so that we can carry everything we need for our yoga practice between home and the yoga studio. No need to worry about this big bag not being able to handle what you put into it. 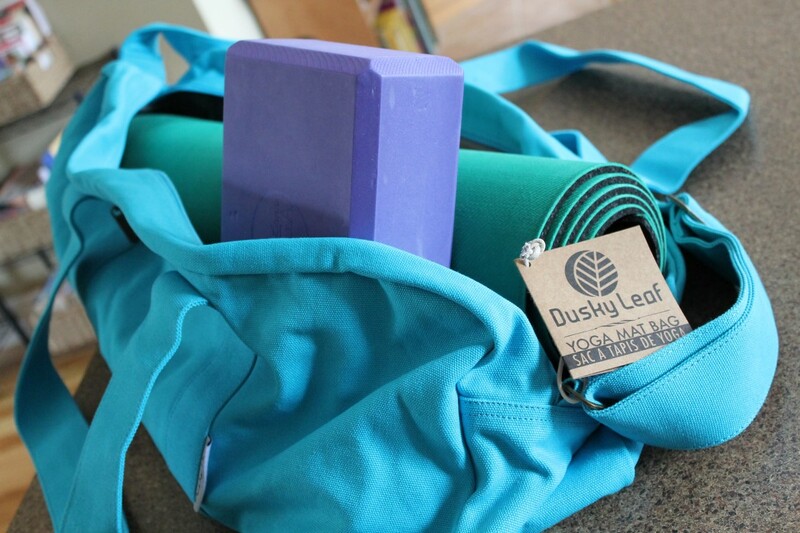 Satisfaction guarantee- “Every Dusky Leaf product is designed to delight and to inspire you in your yoga practice.” Dusky Leaf has a rock solid (as they call it) satisfaction guarantee return policy. If you’re not completely happy with your individual purchase you can return the item(s) within 90 days to get all of your money back. 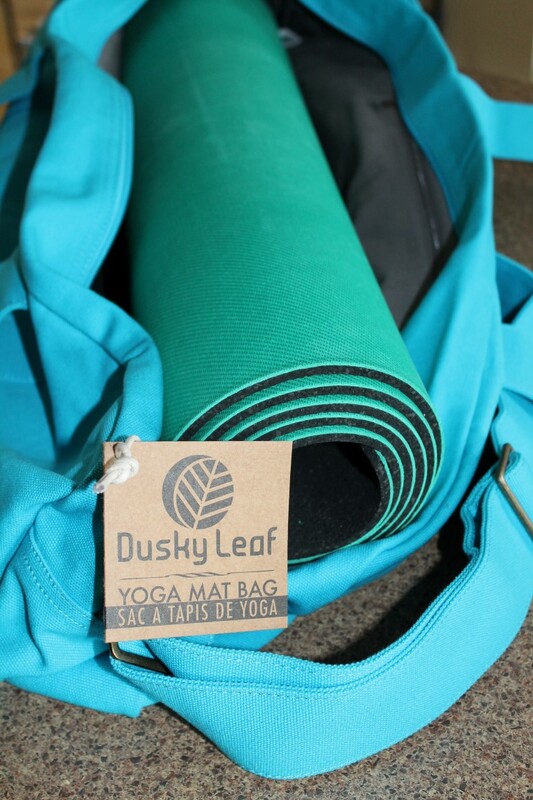 As I mentioned, as a yoga teacher in training, having Dusky Leaf’s big yoga bag during my program has made transporting my yoga gear, teaching tools, and books to my training weekends easy because everything fits in the one bag. No longer do I need to bring two or three separate bags with all of my necessary yoga equipment. I’ve been able to downsize to just one–my cerulean blue (i.e. turquoise) B.I.G Yoga Bag. It definitely makes getting from the house to the car to the yoga studio a whole lot easier than it used to be. If you’re interested to know more about other Dusky Leaf products I’ve tried, read my article on their Zeroslip Yoga Towel –it sure helped me throughout my yoga training to stand on solid ground and hold a pose with confidence. Without a doubt, I’m sure you’ll fall in love with each and every one of their products just as I have. As an added bonus, Dusky Leaf is Canadian! As a Canadian, I try my best to support Canadian companies and companies based in North America as much as possible and when feasible. I also admire Dusky Leaf for having high standards for creating sustainable eco-friendly products, while reducing their carbon footprint as much as possible. As you know and have read before, the more eco-friendly a product is the more appeal it has to me as a consumer. Not only is Dusky Leaf environmentally conscious, but they are also practical and in my mind they go hand in hand. I can’t wait to try some more of their products. Other unique products that seem intriguing are their round yoga bolster, cork yoga block, and natural rubber mat. If you’ve tried any of their products, I’d love to hear your feedback below in the comments. This entry was posted in Lifestyle, Reviews, Yoga and tagged B.I.G. Yoga Bag, Dusky Leaf, Fitness, Health, Lifestyle, Review, Turquoise, Turquoise Compass, Yoga, Yoga Bag, Yoga on the Go by Turquoise Compass. Bookmark the permalink.